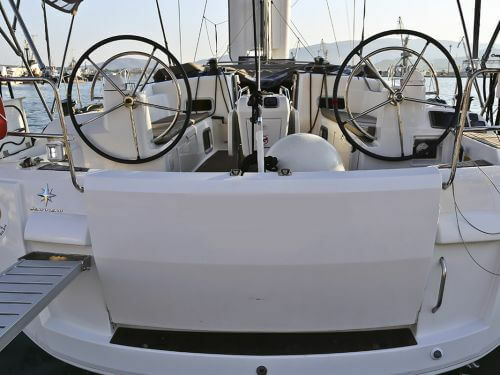 Looking to sail from Volos? Search to find and book your ideal boat, or read everything you need to know: prevailing winds, where to sail, how to get there and more! The Sporades are a popular place to sail in Greece because of fine weather, good wind, and the sheer beauty of the islands - both the natural and the man-made will blow you away: you'll find some of the best beaches in Europe here, along with stunning cliffs and serene vineyards, plus outstanding architecture and incredibly picturesque ex-fishing villages. 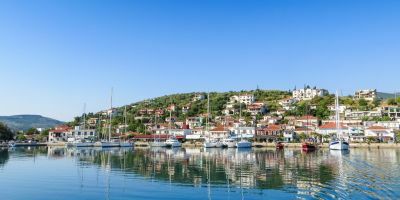 Being on the mainland, Volos is easy to get to, and it's only a daysail away from delightful Skiathos, or even better Skopelos (where Mamma Mia was filmed). There's also plenty of scope to get off the beaten track in a marine nature reserve or to visit a crazy remote monastery. Charter a boat here and see what people rave about! 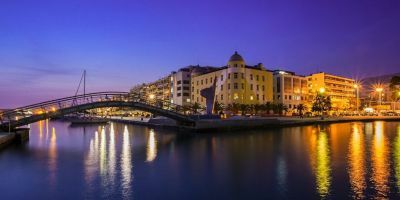 Volos is located on mainland Greece, but that doesn’t mean that it isn’t still an excellent base for exploring remote Greek islands and finding some tranquillity. In the immediate vicinity, Skiathos is famed for being popular with a young crowd, and it certainly has an energetic night-life. The next island along, Skopelos, has been described by some as being the most beautiful of all the Greek islands, though, despite it having been inhabited for thousands of years, it is perhaps most famous for being the filming location of the recent first Mamma Mia film. A beautiful old town with an exceptional array of beaches and a boisterous and lively nightlife, bustling with tourists. A great place to spend the night and blow off some steam. The beach at Loutraki was made famous by featuring in the film ‘Mamma Mia’ but people have been coming to this fishing village for years for peace, tranquillity, and incredible sunsets. You’ll be impressed at the architecture and fall in love with the narrow streets of this idyllic, sleepy Greek town. It’s a wonder to behold from the sea, and is the ultimate place to sit and people watch. There aren’t too many options of where to go when sailing from Volos, since it takes a day or two of sailing to get out into the Sporades islands proper, and then it’s just a case of how many hours you want to sail per day or leg which can determine how far you can get. For a cruising holiday, we’d normally aim to be hitting somewhere between 17 and 27 nautical miles a day, which means about 4-5 hours of actual sailing and leaving plenty of time to explore your start and end points, or to stop, relax and splash about or have a long lunch in the middle. We wouldn’t recommend doing much more than 35 nautical miles in a day because that’s a long time out at sea, and there’s no reason why the village in the next bay, or on the next nearest island won’t be as exciting as the one 35 nM away (unless it really is worth sailing all that way for). But then again, you are on a sailing holiday, so it’s worth getting some sailing in. This itinerary is a six day itinerary which takes in the best of the Sporades: the beauty of the islands and the beaches, and the best three places to spend the night (namely Skiathos, Skopelos and Loutraki, all for different reasons). In total, it’s 127 nM, which means an average of about 21 nM a day, and a fairly leisurely pace. 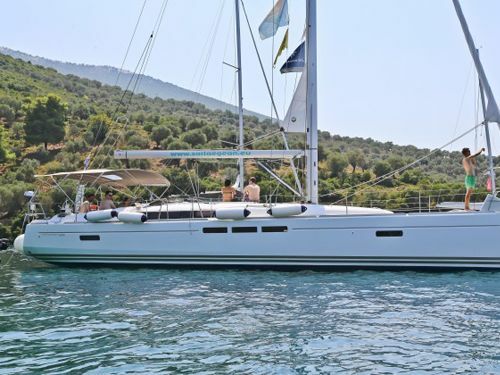 It’s only six days because after checking in and getting everything on board it’s unlikely you’ll have time to do any significant sailing from the home base on your day of arrival – so chillax, check out Volos, and we’ll depart in the morning. And the boat needs to be returned on the Friday night (so you won’t do any sailing on the day of checking out either). Ok, Captain, time to get your crew in order, and the ship out at sea. Make sure everyone on-board is aware of their duties, then let's slip the lines and get out of here! From Volos, we’re heading pretty much due South for the day as we head out to sea. Volos is already fairly remote as far as Greek cities go, but we’re going to get even smaller and more remote as the week progresses. The prevailing wind is a North-easterly, around Force 3 or 4 (except when the Meltemi winds kick in for a few days at a time at the height of the season – so check the weather forecasts carefully if you’re sailing in July and August). Being in a huge bay (the Pagasetic gulf, to be precise), the winds might not be so strong as you broad reach your way down, but you’ll certainly feel the wind in your face once we get island hopping. If time allows, you can nose into one of the bays around the island of Paleo Trikeri, where there’s a couple of nice beaches, but otherwise we’re following the coastline round, keeping it on our port side as we go around the headland, and then pulling in at the first marina you come to. This is Kiriaki, a small, sleepy fishing village which is now a place for tourists who like to be off the beaten track and who enjoy the calm of the sea and the idyllic islands. There’s a fine beach to while away the rest of the sunshine, or the local village of Trikeri is a short walk up to the top of the hill, where they serve the freshest of fresh fish in abundance, with fine views over the sea. This is the life..
Having found your sea legs yesterday, and having drilled your crew into shape, today sees the longest leg of our voyage, and we’ll likely be beating our way up the prevailing wind through most of the day, so if the crew haven’t quite gotten the concept of what tacking is about, it’s fair to say that they might do by the end of the day. Then again, if you’re lucky, sometimes it's possible to make it all the way in a single close-hauled tack. From Kiriaki, we’re heading further along the coast and out, in a North-easterly direction. The island on the horizon is Skiathos, which we’ll skirt around the South side of. We’ll be coming back to later in the week (so feel free to have a quick nosey at Skiathos town as you go past). There are over 75 brilliant beaches dotted right around Skiathos island, so it might be a fine place to stop for lunch or a break. Continuing further in the same direction, we’re heading to the small marina at Loutraki, near Glossa, on the Western side of the island of Skopelos. Loutraki is another remote village which people head to for the beauty and tranquillity of the area, and is most famous for being the filming location for the film ‘Mamma Mia’ – so watch it in advance to whet your appetite if you have the chance. There’s a beautiful beach and a number of decent taverna’s, or you can walk fifteen minutes to the nearby bigger, grander village of Glossa. Being on the West coast, Loutraki is a place where you can sit and enjoy watching the sunset, ideally with a well-earned drink. After the longer leg of sailing yesterday, we’re just hopping around the coast today, which should give you plenty of time to explore one of the wonders of the Sporades – Skopelos town. From Loutraki, we’re heading Northwards to the tip of Skopelos island, likely reaching against the prevailing wind. The wind can sometimes be slow when you’re in the shadow of a hillside, so feel free to head a bit further off the coast to get some more speed. Once at the tip, we’re going to follow the coastline down to the picturesque Skopelos town, keeping the coast on our starboard side. If it’s hot and sunny, you could check out the beaches at Agios Ioannis or Glysteri for a cooling break, but then onwards to the white-washed houses, narrow streets, medieval castles, monasteries and churches of the capital of the island. Skopelos town is genuinely a wonder to behold, and the view of it from the sea is almost magical. Legend has it that the town was originally founded by the son of the God Dionysos and Princess Ariadne of Crete, who used the island as a giant vineyard – but it’s main purpose now is for tourism (and growing olives). The town is a brilliant place to explore on foot, and you can get lost in the maze of cobbled streets and alleyways. There’s a great range of tavernas and bars (and even a night club), as well as a good range of shops to get your provisions stocked up from. Life moves at quite a slow and relaxed pace, and Skopelos is a great place to sit and people-watch. The biggest and best towns in the Sporades islands are sleepy Skopelos and sparkling Skiathos – both beautiful, the former is ideal for tranquillity and romantic strolls, whilst the latter has so many beaches and tourists that it positively bustles with activity, loudness, and throngs of people having lively fun - particularly during the holiday season. Reading those descriptions, it’s no wonder that the Skiathos is favoured by young people, who have enticed bar and nightclub owners to come and set up here, and turned it into a place where the pace quickens dramatically after the sun sets. Neighbouring islands, it’s a fairly straightforward sail to get from one to the other, and there are ferries that make the journey on a regular basis. They normally head over the North of the island of Skopelos, so we’re heading around the South. Head East out of the marina and keep the coastline on your starboard side as you follow it South, then West, then North. You’ll notice you’re sailing in all the directions, so you’ll need to keep adjusting your sail trim to keep pace. There’s a few beaches and bays to explore – some have tavernas to grab a bite to eat, but there’s also the chance that you’ll spot seals and dolphins in others, if you keep a decent lookout. Once you’re past Panormos, you should be able to see Skiathos and can head in a North-westerly direction, reaching across the prevailing wind. Skiathos Town is on the starboard side of the island as you look at it, so head for that sort of area, then bimble your way into the marina, which is to the East of the old town. You can read more about Skiathos in our destination guide to find out where to go in the town (and to read about more potential places to sail in the Sporades islands), but you’ll find a very pretty old town with plenty of bars, restaurants and shops, and if you’re planning on having one big night with the whole crew, here is the place to do it. Hopefully you enjoyed the night in Skiathos and aren’t feeling too worse for wear this morning. Unfortunately, after a few days of visiting the islands, it’s time to start heading back to the mainland. We’re heading South-west down the channel to a small farming village of Orei, which has been inhabited since around 5,000 BC, but is mainly notable for having a couple of historic castles and a giant marble statue of a bull. There’s also a reasonable range of restaurants and bars on the waterfront, and if you’re still interested in beaches, there’s of course some of those within easy reach too, and a reef that is good for snorkelling and scuba diving. Wait, what? How is it the last sailing day already?! It feels like only yesterday that we set off from Volos? Hopefully you will have enjoyed your holiday and the week of sailing, and your crew have all behaved. Thankfully, this isn’t quite the end yet – there’s a small matter of 25 nautical miles to cover before we return to living on dry land. From Orei, it’s almost a straight line Northwards to Volos, sailing up towards Kiriaki (where you spent the first night), and onwards into the Pagasetic gulf, then up to Volos. You’ll likely be reaching against the prevailing wind, and it’s possible to do it in one tack, but it’s obviously more fun to put in a few tacks and to keep your crew on their toes, so maybe you can circumnavigate the island of Paleo Trikeri on the way? Arriving back in Volos, you’ll need to visit the fuel berth (which you should be able to spot by the long queue of other charter yachts also waiting to be refuelled, or it’s on the south-west side of the fishing boat harbour, to the West of the marina). Once you’re full, take the boat to about the area you got her from, moor her up one last time, and then salute the harbour-master as you shut down the engines. Someone will be along to inspect the boat tonight, but you’ll be sleeping aboard tonight, and will complete the formal check-out tomorrow morning, before departing the boat, and letting her drift off into the sunset with another skipper and another crew. 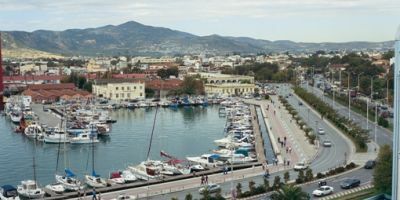 If you’ve not yet seen much of Volos, then now is a good time to step ashore – it’s a nice town in its own right, and there’s enough to see, do, eat and drink to keep you busy. And then you’re off. Hopefully you’re returning with really fond memories of the Sporades, with better friendships with all of the crew, and a giant smile on your face. Safe travels home, and we’ll hopefully spot you on PlainSailing.com in a few weeks time as you start to plan your next big adventure. Godspeed. If your ideal weather is sunshine and ‘hot, but not too hot’ then Volos is the place for you. They have sunshine for over 300 days a year, and, whilst it is a warm place to live throughout the year (by comparison with Northern Europe) even at the peak of summer it struggles to get up beyond the low to mid-thirties. In winter, you’re unlikely to see snow on the sides of Volos castle, because the temperature only dips to about ten degrees Celsius. That’s not far off t-shirt and flip-flop weather, even at Christmas! Things hot up from May to October, when the average temperature is over 20 degrees, and between late June and early September, the weather is delightful: sunny and warm, but not so swelteringly warm that you’ll be racing off to find pockets of shade to hide in. On the water, with the wind, you can easily get away without having air conditioning. You already know that the weather is great in Volos all year round, so you might be surprised to hear that the sea is actually warmer than the air for about seven months of the year! In fact, the water temperature seldom drops below 15 degrees – which means it’s swimmable all year long, although 15 degrees will feel a bit fresh. By the end of May, and for the rest of the sailing season, the sea reaches a more pleasant (but still refreshing) 20 degrees, which means you won’t need to think twice before plunging into the crystal-clear waters. If you’re there in August, then the 25-degree water will feel almost like a swimming pool, and you’ll be able to stay swimming in there for hours without getting cold. Aside from the beautiful islands and beaches, cute places to visit and delightful weather, the other thing that makes sailing from Volos so popular is the dependable winds. In summer, the prevailing wind is a Force 3 or Force 4 which arrives from the North-east, and allows you to make decent speed and excellent progress from island to island (and to lay off the motor for the best parts of the day). Generally, the Meltemi pass after a couple of days, and the prevailing North-easterly winds will return. The winds are less predictable in the off-season, and winds can arrive in weather systems from the North or the South – meaning it can be brutally cold mountain winds from up top, or tropical winds from down below. It keeps the sailing interesting, though, and temperatures are still warmer than the UK gets in the spring or late season. What is the Current Weather in Volos? Volos is an ancient Greek city, and has more than its fair share of myths and legends: it is such a beautiful place, with both the coast and the mountains, that it was reportedly where the Greek God Zeus chose for his son, Magnes, to grow up in. It was also once the homeland of the centaurs, half-man-half-horse beasts who controlled the local forests and foretold the future. 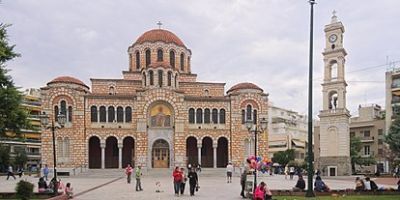 But that’s not all – it has a plethora of grand and impressive buildings – from churches to castles and palaces (including the once-mighty Volos castle) - and many consider it to be the most beautiful city in Greece. It was also the home of Jason (of golden fleece fame), and there is an exact replica of his famous Argo ship on display in the marina - made by studying ancient manuscripts and crafted painstakingly using methods from the olden days. The city boasts some outstanding beauty, and it is well worth a day or two exploring on foot. Local hills offer excellent views over the city, and there’s a beautiful sprawling coastal park at Agios Konstantinos where you’ll find all the locals and University students relaxing when the day heats up. Whilst you’re here, check out the local specialities of spoon-sweets (sweets served on a spoon!) and Tsipouro (brandy-ish). Being a University town, there’s always plenty enough happening in Volos – from performances of theatre and dance, to cookery schools, and parties well into the night – so do have a quick google before arriving in Volos if you’re going to be there for more than a day or so. The biggest festival of the year is the Volos Festival, which runs from mid-June for three weeks, and sees the whole city transformed into a stage, with live street performances by the great and good of the local music, dance, theatre, and mime scenes. The festival is as much about educating and entertaining locals as it is about tourists, so unfortunately, you'll find some parts are only in Greek. On May day, there’s a flower festival, when one of the suburbs of Volos (Alli Meria) has flowers galore, and locals take to the streets. In June, there’s the Festival days of Music and for the first 15 days of July, you’ll find a book festival and market along the waterfront. And in September, straying a little outside of Volos, you’ll find weekend festivals dedicated to celebrating apples, pears, wine, and chestnuts. Creperie Poquito – it’s traditional in Greece to take a stroll after dinner and then find somewhere else to eat dessert, and there is no better place for something sweet than this place. Crepes aren’t really all that Greek, but when they taste this good, they’re irresistible. They also do savoury crepes, and they’re only a few hundred metres from the marina (13 Skenderani, Volos). Me Zen – The place to try local seafood cuisine, and the tsipouradiko culture, where drinks of the local brandy food are served with generous helpings of food. They’ll feed you all sorts of delicious grilled fish or meze’s, all accompanied with a vibrant atmosphere, and by the end of the night, you’ll be singing and dancing with strangers. Two streets back from the marina (Alonnissou 8, Volos). Lepi Tsipouro kai Mezes – The best of the restaurants located right next to the marina, and specialising in local dishes, including grilled fish, local shrimps, and the best calamari in Volos, all at very reasonable prices. (23 Argonafton, Volos). Alter Ego Music Bar - this bohemian bar has live music (rock, jazz or easy listening) on weekends, and is the perfect sort of place to relax and chill out until well into the early hours (Αγίου Νικολάου 38, Volos). Vinsanto Wine Bar – Thought the Greeks don’t do great wine? Think again. Come and sample some of their best local and national wines (or play safe and go Italian or French) at this laid back, but elegant establishment. They also do food (Αλοννήσου 2, Volos). Grooove Cocktail Bar – Quite simply the best cocktails in the city, and at reasonable prices. They make quite a range and if you like cocktails, you’ll like this place (if you don’t like cocktails, you haven’t tried the right one yet!). Almost always crowded in the evenings (Koumoundourou 40, Volos). 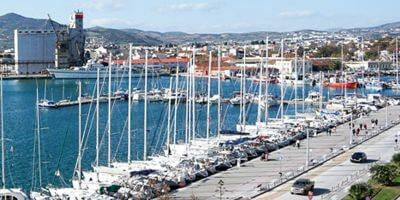 Hotel Phillipos ** - c. £50 for a double room – a cheap hotel within 100m of the marina. Basic, but clean and cheerful, and the ideal place to spend a single night on a budget (but possibly worth spending a little more money if you’re planning on staying longer). 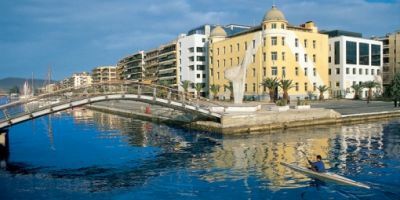 Aegli Hotel *** - c. £85 for a double room – also located within a stone’s throw of the marina, and with some balconies that overlook it, this mid-range hotel is a comfortable place to stay, with a modern, spacious and elegant interior, and a fabulous breakfast. Volos Palace **** - c.95 for a double room – a great value four-star hotel to start or end the holiday with all the trimmings. Rooms, service and meal are excellent as standard here - they really do make you feel special, and this hotel is only a short walk from the marina. 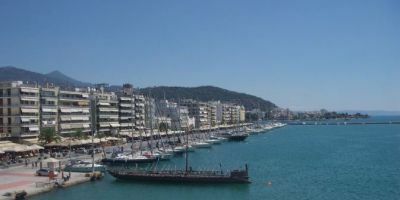 Volos port is shared amongst commercial vessels, local fishermen, and, of course, sail tourism. All this makes the marina a hive of activity, and, coupled with locals and tourists enjoying an evening stroll along the marina road, the whole area seems alive. The facilities for sailors are a little dated (though it has all the usual amenities) but there’s a whole townful of shops, restaurants and amenities which are within very easy reach, and you can even buy fish fresh direct from the fishermen each morning!. You’ll find a fair number of smaller supermarkets and mini-marts around the town, but if you’re after somewhere to do a ‘big shop’, the nearest decent-sized supermarket (with a great range of produce) is the AB Vassilopoulos at 2as Noemvriou 107, Volos, which is on the main road about 500m north-west of the marina. 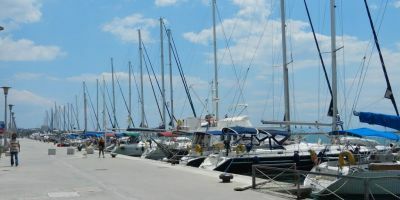 Volos airport is located about 25 km to the south-west of Volos, and is connected to parts of the UK and mainland Europe by direct flights during the sailing season. The easiest way to get to the marina is via taxi or private transfer, which is around a 20-minute drive - we can help to arrange these for you, so please ask. It’s also theoretically possible to get to the marina via public transport - buses take passengers to Volos town centre (and the marina is a short walk from there). The buses are scheduled to coincide with flight arrivals, and they often wait for delayed flights, so don’t expect to go anywhere too fast (check out the timetable).